Maybe that pieces only function is as a preload sensor for the DDC? 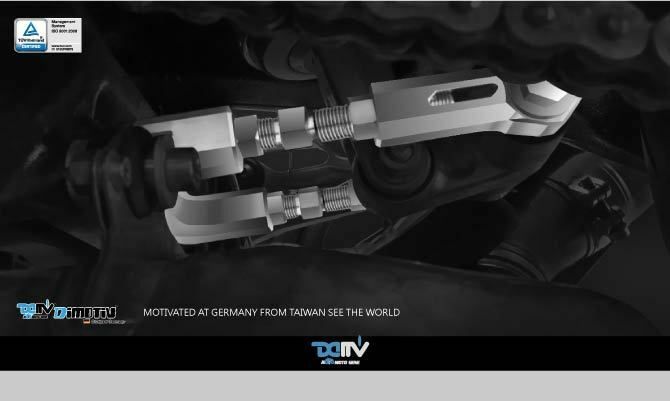 I would guess a BMW suspension technician would have to answer that question. Sometimes I think the next BMW I buy will be with normal old fashioned suspension. 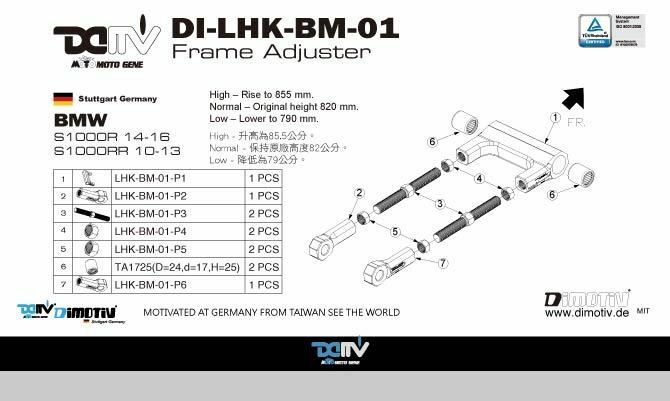 I believe that as the more the rear suspension compresses the more the DDC stiffens up. The DDC is looking at that sensor all the time. Everyone is working on their electronic dampened suspensions all the time so as much as I tend to agree that normal old fashioned suspension may be better there will come a time that won't be the case. That time, really, is already here, but we just didn't get "top of the line" goodies with our suspension. 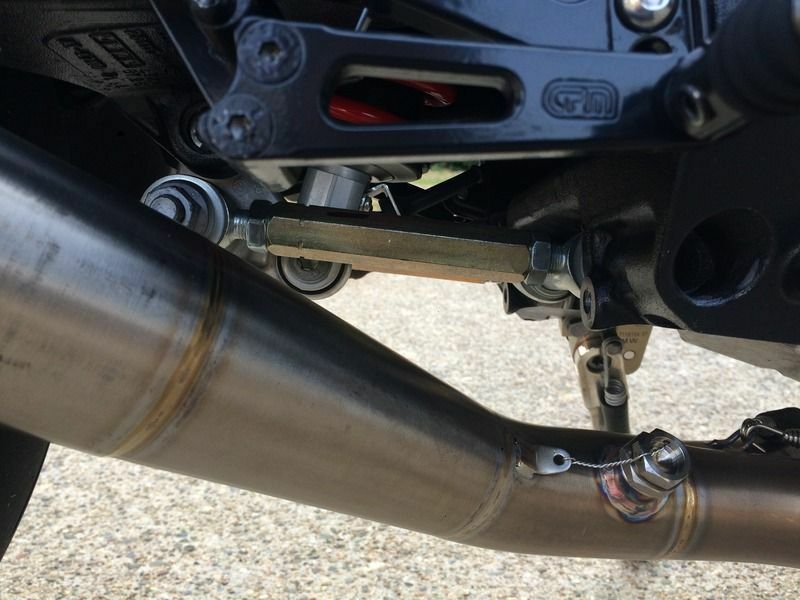 Last year had some light cosmetic damage (scratch) to the swingarm when the exhaust can touched the swingarm. Without any encouragement BeeEm offered to replace the swingarm rather than repair. No quibbles on my part but I cheekily said I’d love a clear-coat RR jobbie rather than the black R original. 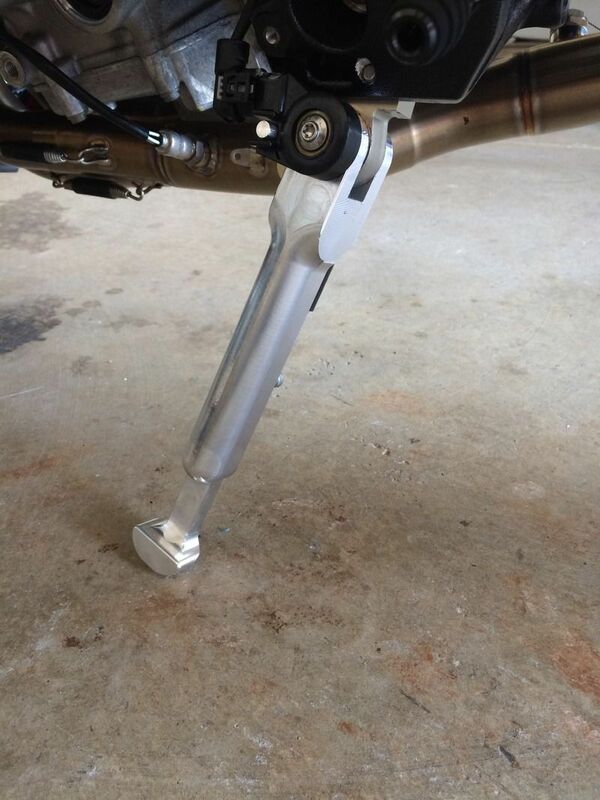 So after some creative stock ordering my BMW dealer chums managed to take delivery of a new HP4 swingarm. Just had it fitted during the quiet winter period – the DDC had to be recalibrated as part of the re-fit. I’m happy with the result ! Anyone tried that out yet? 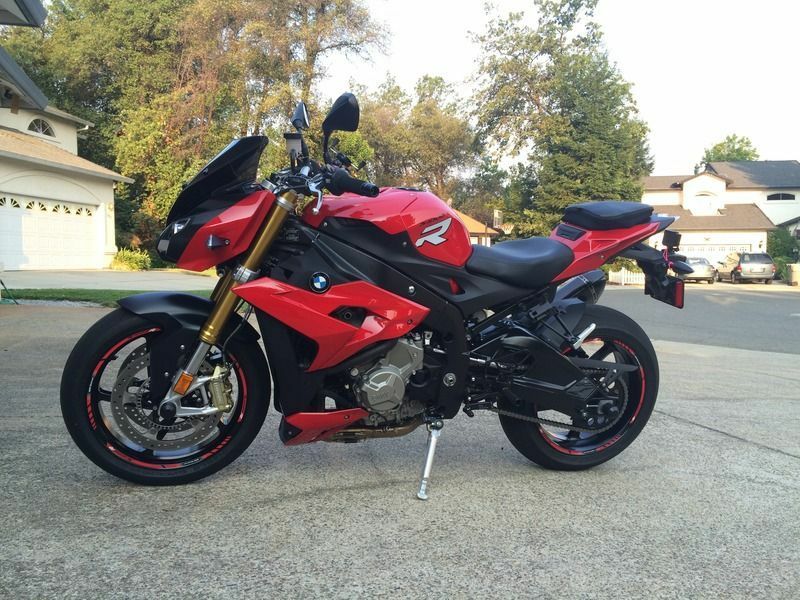 I gotta lower my S1000R and i guess i need to find out how to calibrate the DDC. 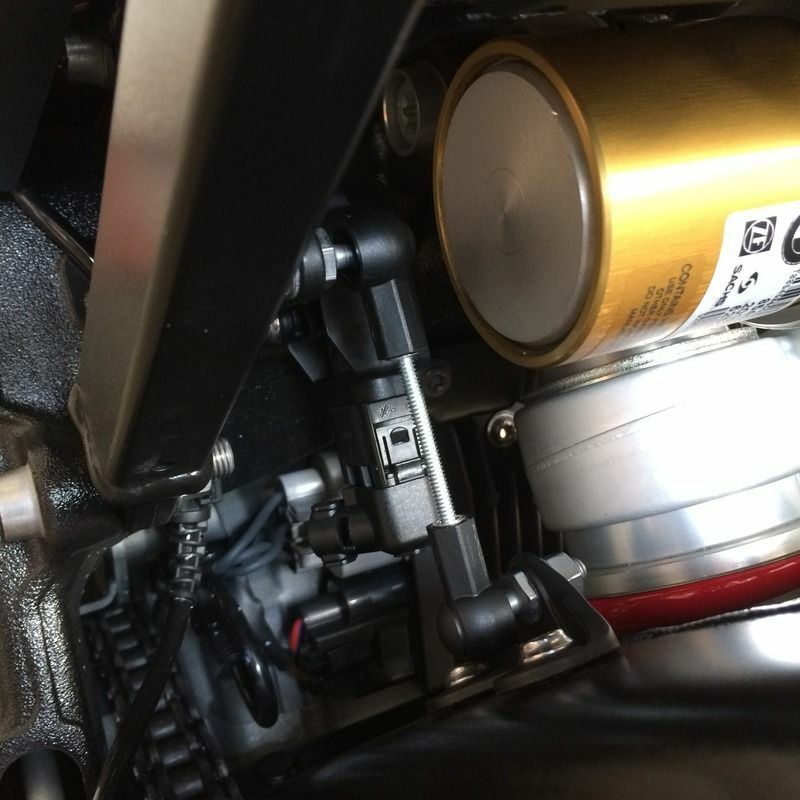 I know the S1000RR has this function out of the box, but i can't find it in the S1000R. 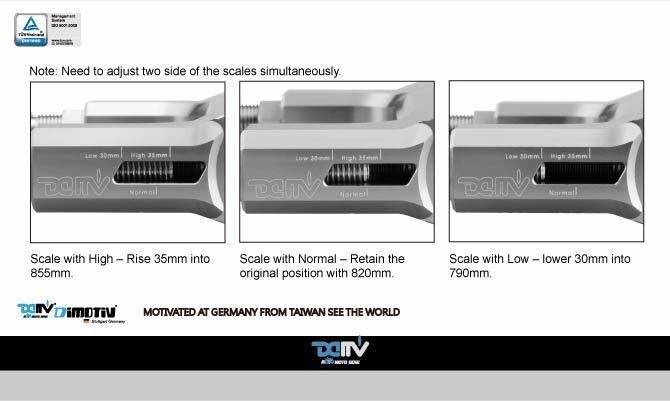 @Dod66, do you know exactly how your S1000R DDC has been calibrated? Over the weekend, I lowered my R using lowering links and an adjustable S1000RR kickstand from http://www.soupysperformance.com I also dropped the forks .75" to match the rear (made possible by way of installing these bar risers: http://www.twistedthrottle.com/handlebar-riser-barbacks-top-clamps-for-28mm-bars-pair-1-25-rise-1-pullback ) My last two bikes have been S1000RR's and I did the same with each of them, but my R is the first bike I've had with DDC so that presented new questions, many of which were the same as encountered in this thread. I'm 5'7" tall with a 30" inseam and weigh 165 lb before suiting up. Even with boots on, a 32" seat keeps me too close to my max for a comfortable reach to the ground. A small stone, or leaf under foot might make the difference between staying upright and dropping the bike. It's not difficult to reason that if the bike was lower, I'd feel taller/flat footed. To that end, I lowered the bike .75" or about 20mm. As mentioned, I had wondered what effect this would have on the bike's suspension and my comfort. I assumed that it would be much like what other, larger riders have described, a more taut feel that was less pleasant. My assumption was correct. Even with the DDC set to soft in the Road mode, the ride was not nearly what soft used to be. Using Dynamic mode made it firmer yet. 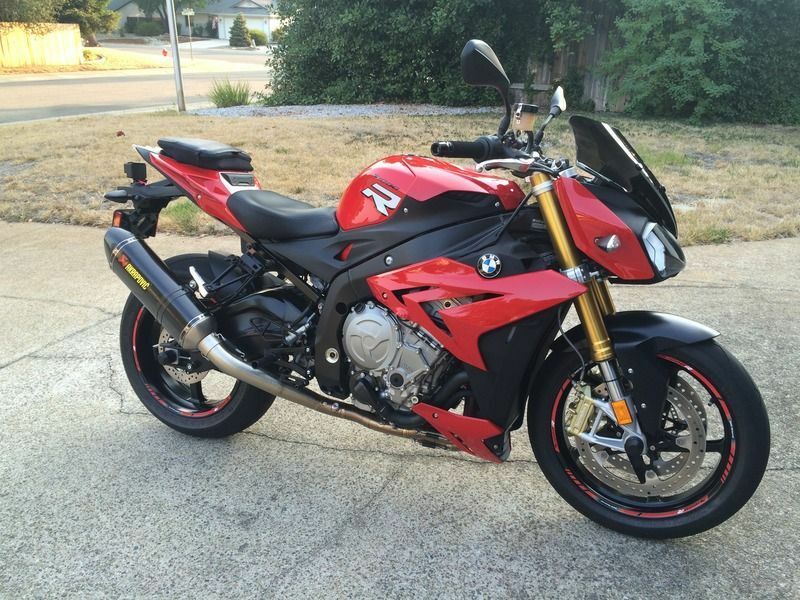 At this point, I would rather have left the bike at stock height in order to preserve the more comfortable ride and just suffered with the tip toe'ing scenario in parking lots. 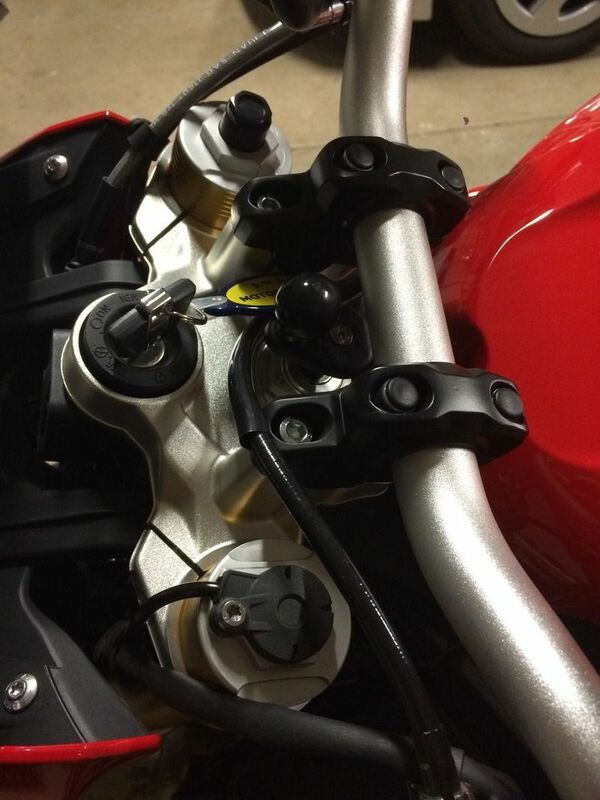 I'm going to assume that most people reading this understand the rear height sensor that is made up of a potentiometer connected to the swingarm by way of a small linkage rod. 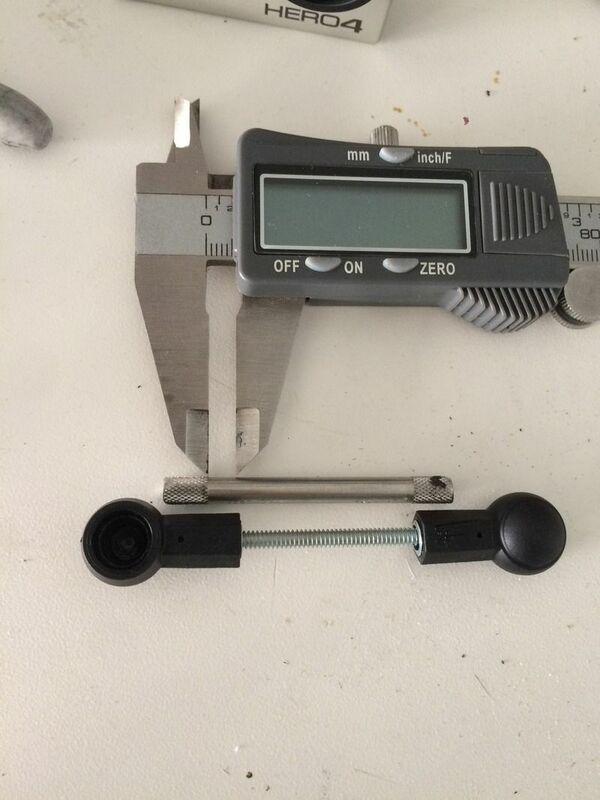 This rod has a black plastic cup at either end and snaps together with the potentiometer at one end and the swingarm at the other. 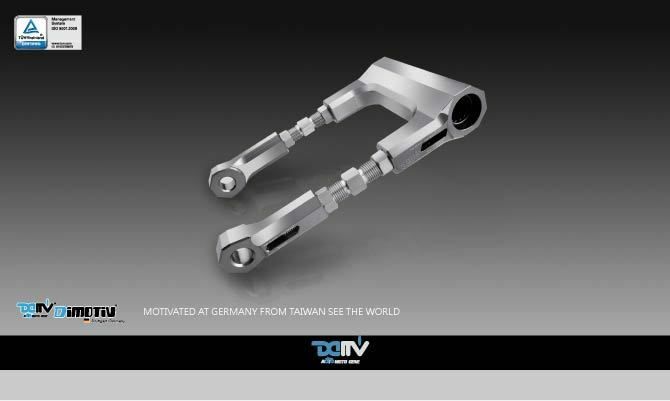 By lowering the bike, the swingarm raises the rod, which in turn pivots the potentiometer and tells the bike that it's height has dropped and to make an adjustment to the DDC. Basically the bike thought I was much heavier based on the height it was measuring. To counteract this, I've read of the possibility of having the sensor recalibrated, but this would require a visit to the dealer and $ to pay for it. I wouldn't mind paying for it, but the closest dealership is a few hours drive one way. I figured if I could decrease the length of the height sensor's linkage, I could trick the bike into thinking that it was back at stock height. That's what I set out to do. My solution involved pulling the black plastic ball cups off of the linkage rod (they're pressed on), and making the metal rod that connects them shorter. The distance between each of the black cups was originally 39mm and I estimated that making it 34mm would do the trick. Rather than cutting the original rod, I replaced it with a 6-32 threaded shaft and installed matching blind nuts into each of the black plastic ball cups. The blind nuts had to be pressed into the ball cups, then once my 6-32 threaded shaft was cut to the desired length, I threaded it in to a ball cup at either end. 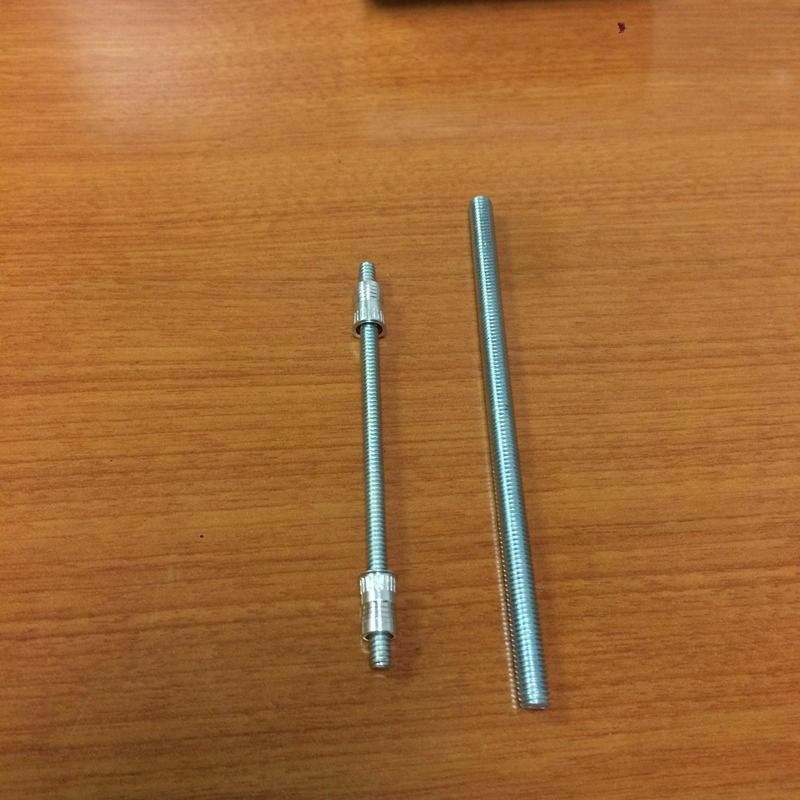 Total cost for the modified linkage rod was about $3. I snapped the rod into place and took it for a test ride last night. It was like magic... I had the benefit of being flat footed, together with the comfortable ride I loved when I first rode the bike! This was a very easy and inexpensive solution. As a final precaution, once I've ridden the bike more and determined that the height and rod length is exactly as desired, I will cut a length of shrink tubing to fit between each of the cups, with a drop of CA at either end. This will ensure that the ball cups can't loosen from the rod, but allow me to break the shrink tubing loose if need be. 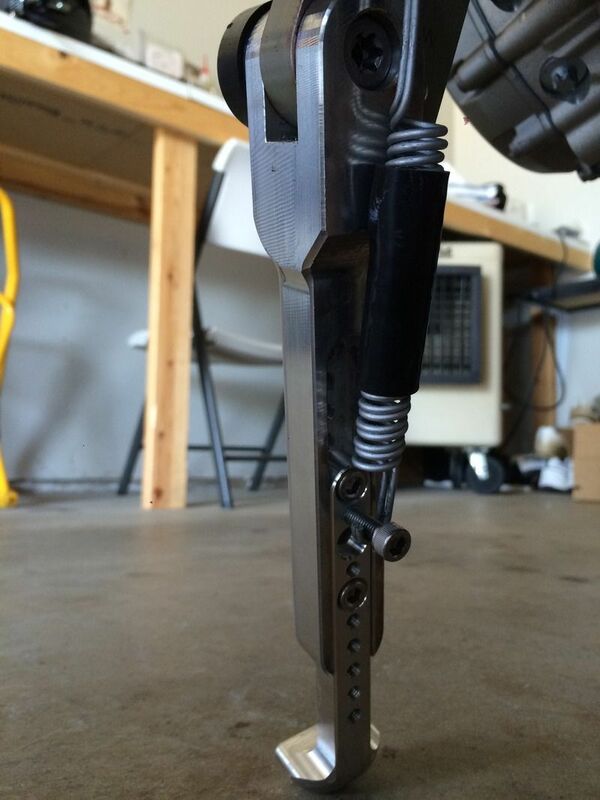 Bar risers, forks slid up .75"
How exactly do you lower the front forks? And I’m assuming purchasing bar risers are necessary if you’re going to drop the front that much? 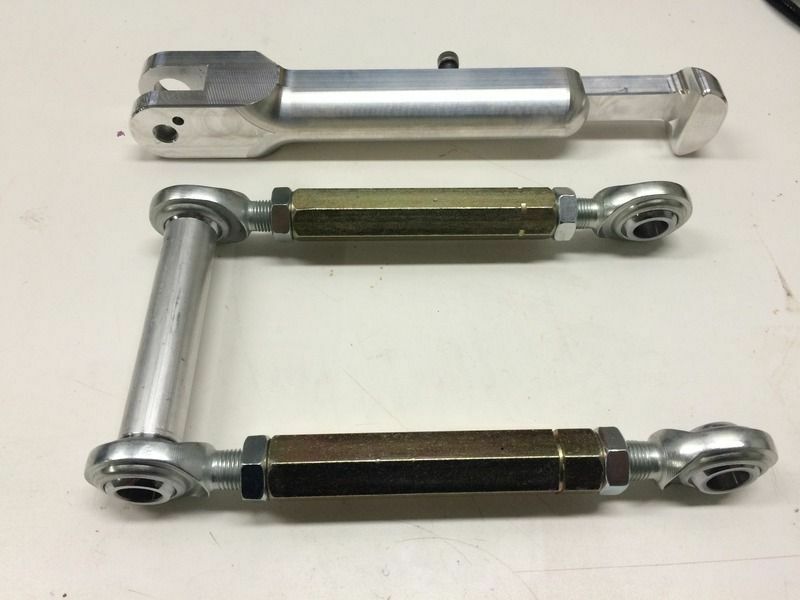 Support the weight of the bike, loosen the pinch bolts that hold the fork legs in the yokes (triple clamps), slide both fork legs upwards by the same amount so that more of the legs are visible above the top yoke, tighten up the pinch bolts that hold the fork legs in the yokes. Don’t go too far or you risk the front wheel / mudguard hitting the radiator when the forks compress over bumps. Makes no difference to the distance between you and the handlebars, so risers aren’t necessary.